There’s a an unusual smell in the countryside of Ragusa in September- it’s a sweet, nutty odor that makes one pause and think, what’s that? If you follow your nose, you’ll eventually end up in Frigintini at one of the last remaining carob mills in Sicily, near the town of Modica. And the smell will now border on a stench. Step out of the way as a truck comes roaring up to unload sacks of carob pods, destined to be separated into the seeds – the most precious part – while the rest is ground into animal feed. This year the carob harvest is exceptionally abundant, and the amount of carob pods here is startling. There is a mountain made of carrube lying in the sun, the mill machinery is clanking away, the owner is shouting unloading directions to the new arrivals, while his wife Biagia calmly greets us with a smile and willingly shows us around. 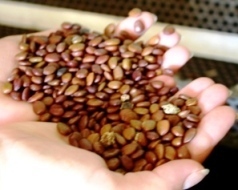 A machine breaks up the pods, and spews out the precious seeds into a separate bin. These will be bagged and sold to the food and cosmetic industries, to be made into a flour used as a natural thickener and gelling agent. Biagia tells me she never buys any food products that have artificial thickeners. “Read the label, and buy carob”, she advises, “è tutto naturale. 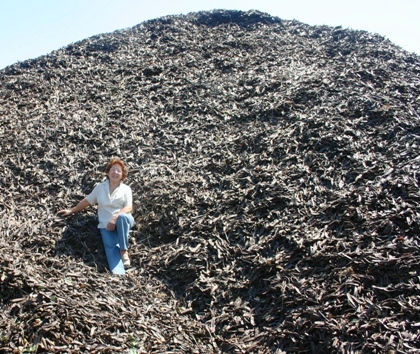 And it’s part of our food culture.” The rest of the thick sugary carob pod is ground up into various sized chunks, and sold as animal feed. It’s a beautiful day and I head off with my neighbor Beatrice to get a closer look as to where all this carob is coming from. We find some farmers whacking a carob tree with a long wooden pole, then gathering the pods into sacks destined for the carob mill. They wave to us as we go bumping down a narrow country lane, locally called a vanedda. I squeeze the car between an opening in a stone wall, and we clamber out into a grove of beautiful old trees, the ground draped in orange nets to catch the pods as they fall. As we walk deeper into the terraced hills, the earth because white and chalky, the carob trees ever larger and more glorious, until we feel like wee people from a fairy tale. 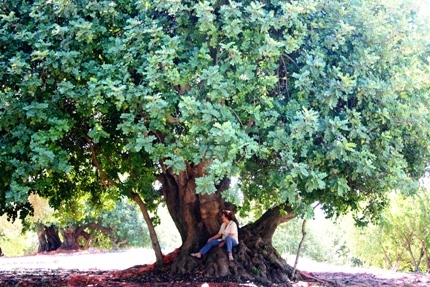 The dense green foliage of one magnificent tree spreads out 10 meters wide, the huge gnarled trunk easily seats the two of us with room to spare, and hundreds of carob pods dangle over our heads. Though it’s a hot sunny day, under the carob tree it’s cool and dark. Beatrice chews on a carob pod, an acquired taste. It’s quiet. Occasionally there is a rustle and plop as a carob pod falls from a tree. 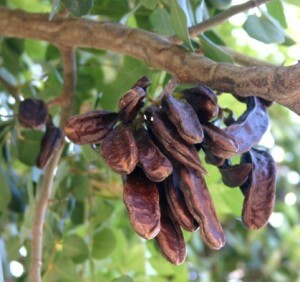 We sit there, enjoying the silence and the sweet smell of carob. 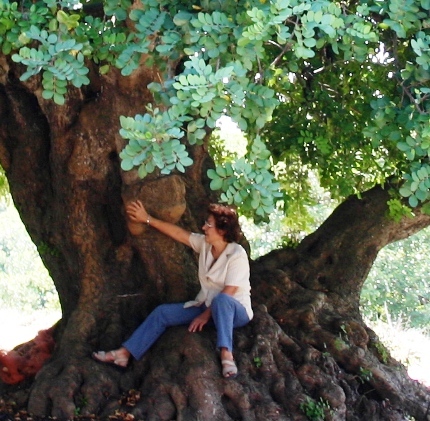 Then I remember: I first fell in love with this countryside when I went for a walk in eastern Sicily andI stopped to rest under a carob tree. Eventually I decided to move here. Today, I’m glad I did. Read about the delights of carob honey and pairing it with caciocavallo cheese from Ragusa. I have a faint memory of my grandmother and carob beans in her kitchen -I think it was christmas. I wonder, do they use carob for baking in Sicilian homes there, as that’s were I was. As kids in Canada we grew up eating carobole as a treat when they were available…still love them and have a bag beside me right now! We saved the seeds to make Rosaries and even tried growing a few. Ground up carobole (no seeds) is a special ingredient I add to my cakes and biscotti. Give it a try — these are not just for animal feed! @Biagia, sono contenta che ti è piaciuto l’articolo, e ti ringrazio per la tua ospitalità al mulino. 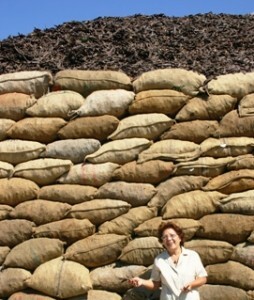 Biagia, I am glad you liked the post, and thanks for your warm hospitality in showing me the process of the carob mill. Anche il caffè è buono- your coffee is good, too!